Two Plymouth students have worked alongside sporting excellence scholar Antony James to create a book aimed at helping children learn how to swim. Pictured (L-R) are Emma Hutchings, Partnerships Intern at Plymouth University, who facilitated the book's creation; Antony James; Hannah Stamp; and Chen Zhen Lee. 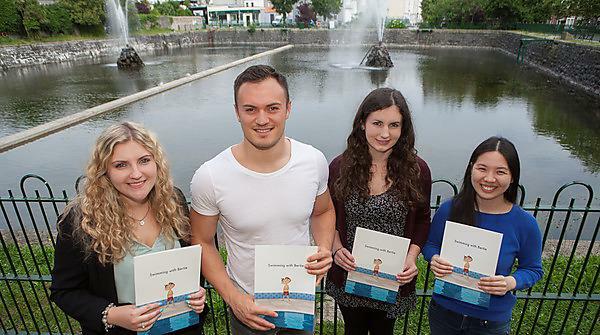 Two Plymouth University students have created a book aimed at helping children learn how to swim. Swimming with Bertie was written by second-year English and creative writing student Hannah Stamp, and illustrated by third-year illustration student Chen Zhen Lee; telling the story of a young cat who overcomes his fear of the water. The book was the brainchild of University sporting scholar, psychology graduate and retired Olympic swimmer Antony James, whose University partner company, Aqua Elite, wanted to show children that swimming was an important life skill. With a basic project brief to create a book aimed at five to eight year-olds, teaching them how to swim, how not to be afraid of the water and how to employ basic water safety, Antony contacted the University to see if there were any students who wanted to undertake the challenge. And, only a few months after Chen Zhen and Hannah signed up, the book launch took place to a great reception. The born and bred Plymothian is already a Commonwealth Games silver medallist, and qualified for the 100m butterfly. He has swam in front of a rapturous home crowd, going up against the most successful Olympian of all time, American Michael Phelps. Not only does he run his own business now, but he’s going for the 2016 Olympics in Rio de Janerio and nothing can stop Antony from being the best.